It's a bird, It's a plane, it's a raccoon? 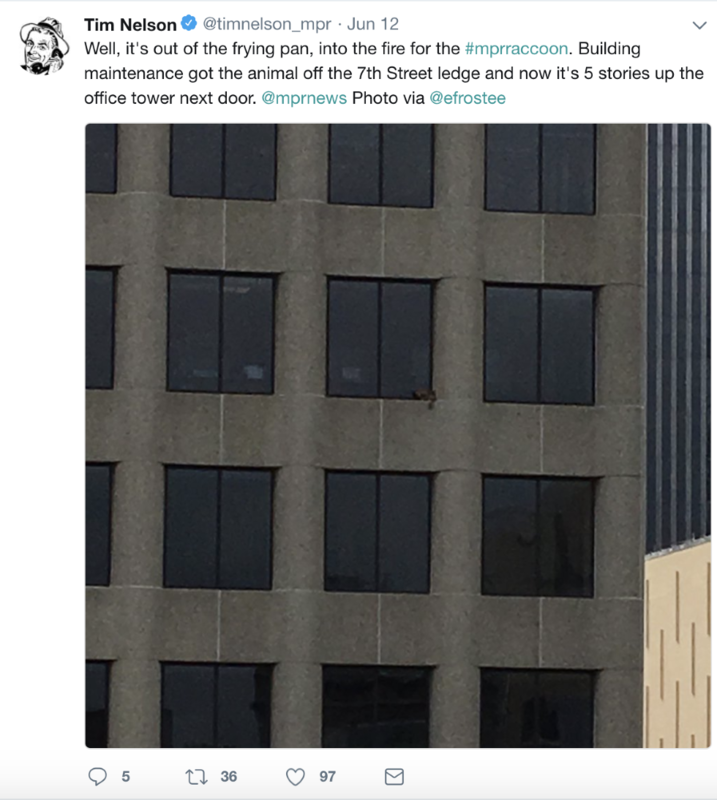 While most of us are impressed with ourselves if we get out of bed before noon, work out at a point during the day or go to bed at a recent time, this raccoon in St. Paul knocks us out of the park by scaling a skyscraper. Yes, you read it correctly. 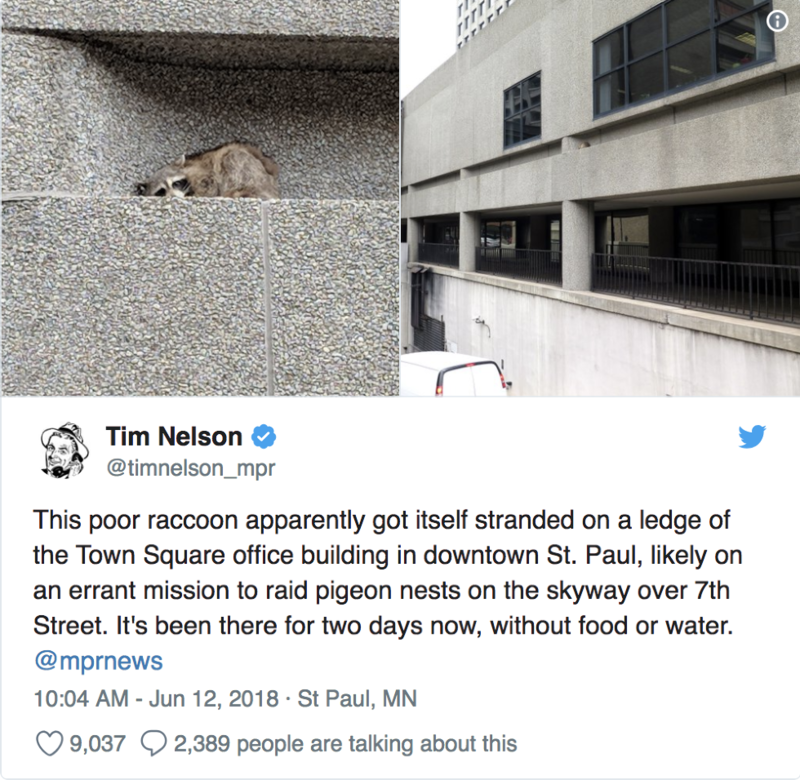 While raccoons are known to be skilled climbers, it was quite unexpected when this little guy made it up a 25 story building on Tuesday, which proved to be a struggle that captivated the Twitter universe. 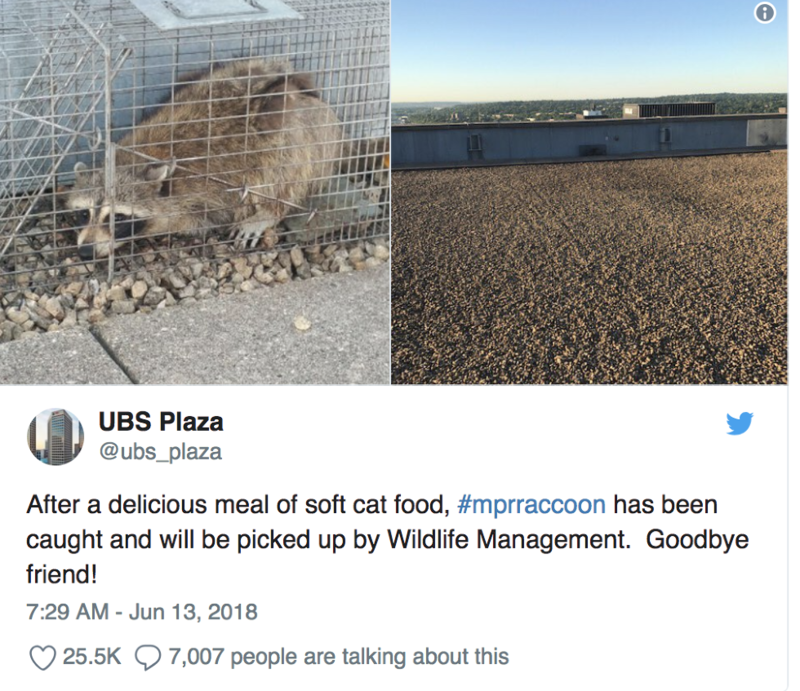 What we would soon know as the "MPR Raccoon" started his journey as what some assume was a quest to find food in pigeons nests in the skyscrapers ended up being an epic journey for survival. 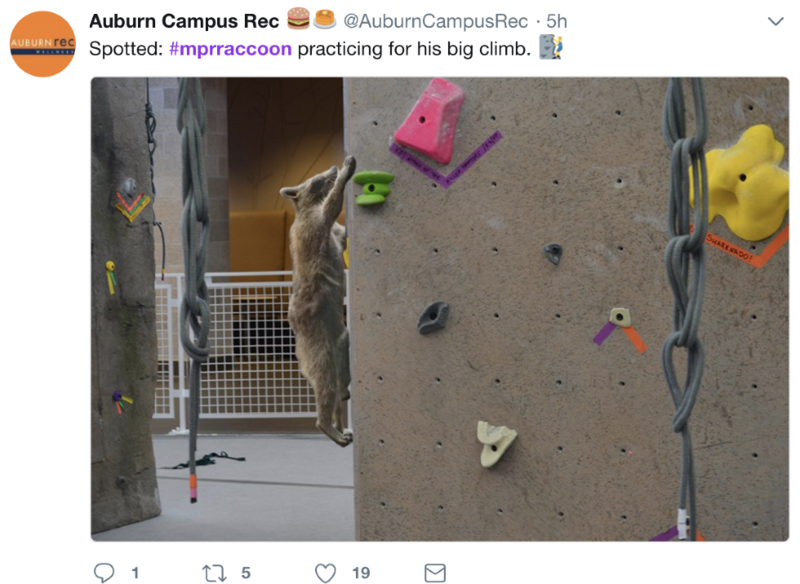 Luckily, a member of MPR, Tim Nelson, took to social media to share all of the latest updates of the raccoon's climb. The raccoon ultimately looked defeated at first, giving up and awaiting whatever was next. It wasn't long until it gained courage to plan his climb. It was officially in survival mode, determined to save itself at whatever cost. It was cruising at first, making incomprehensible strides up the building. Even eventually taking a well-earned nap at the 22nd floor. 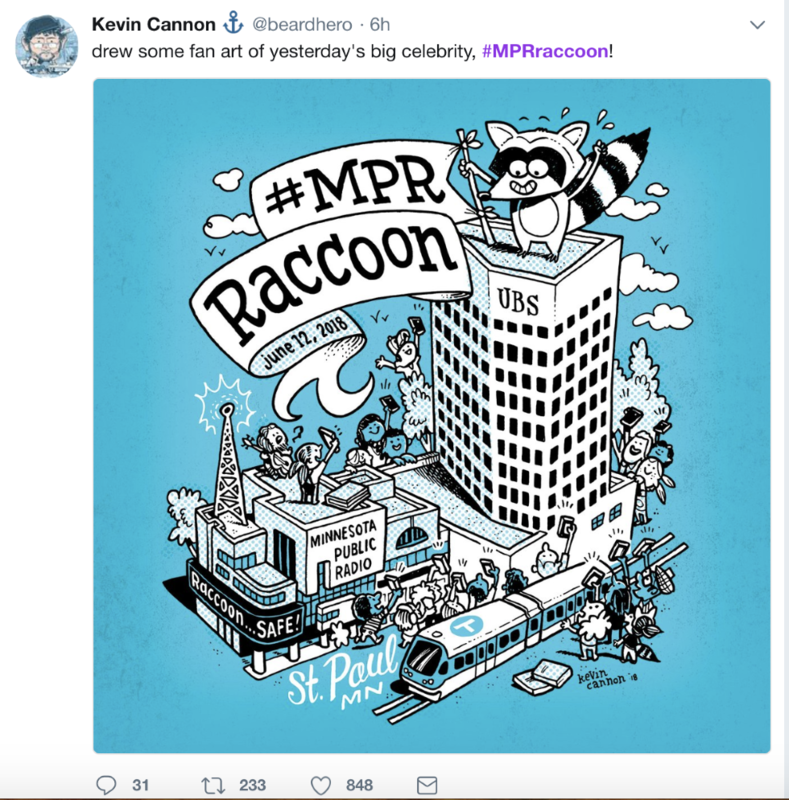 At this point, the story and the raccoon were gaining coverage by Minnesotans and internationally on television and through social media. 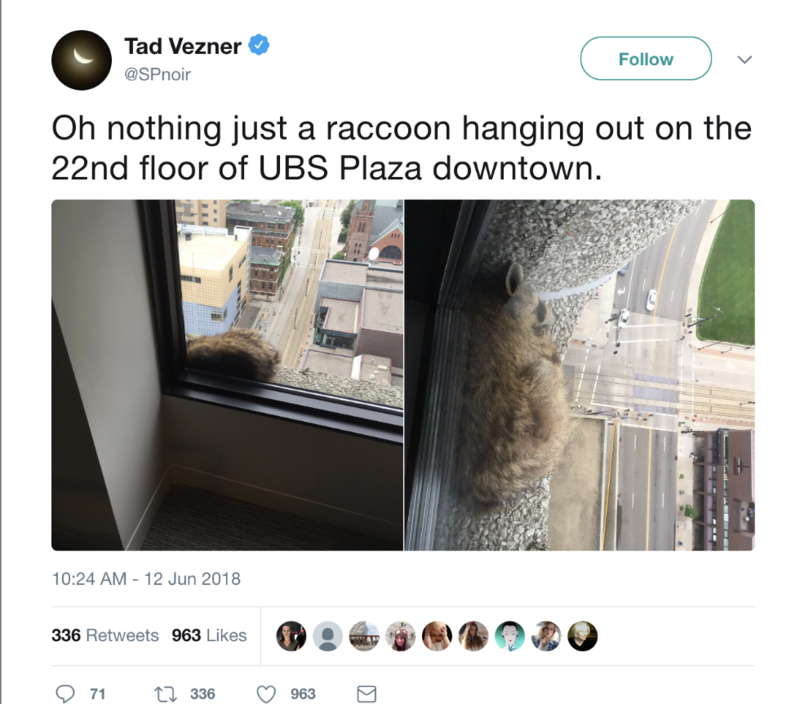 The raccoon even gathered a crowd at the bottom of the UBS building that was giving their support to it as it continued to trek onward. It continued at nightfall, even with going more than a day without food or water. Since it was already discovered that the only way out was up, the raccoon had no choice but to keep going. Eventually, it made it to the roof where a bowl of cat food awaited him in the early hours of Wednesday morning. Here, he was safely captured by Wildlife Management and was released in an undisclosed location. This raccoon has inspired many to work hard and achieve your goals, as well as plenty of Twitter memes. 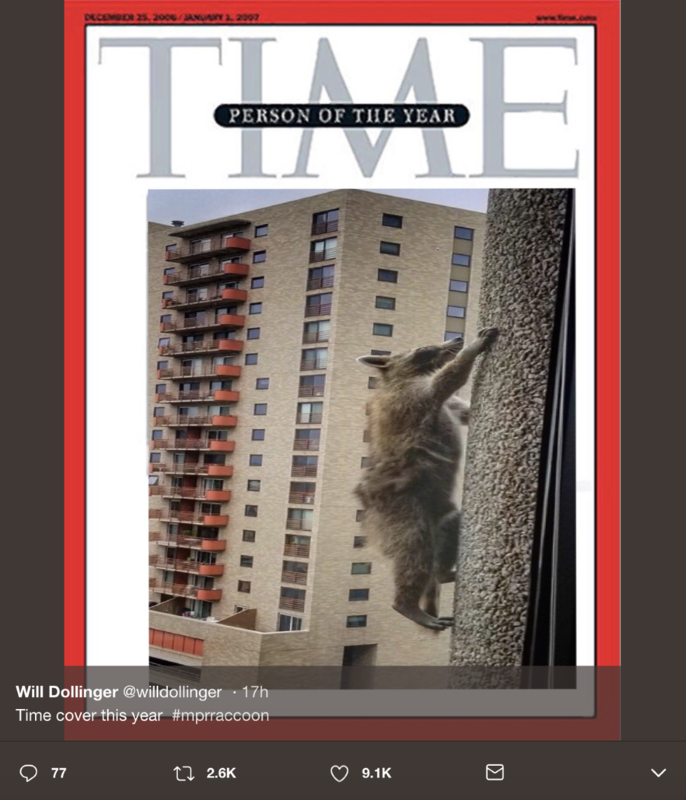 While scaling a skyscraper is no easy feat, this raccoon simply accomplished the impossible and is now his own celebrity with his own clothing and Twitter account. So, what's next for it? Maybe a memoir or a blockbuster film capturing his journey? Well, if there's one thing you get from this story, it's that anything is possible and a raccoon accomplished more than you today.